A slice of pumpkin pie with whipped cream. Baking a pumpkin is similar to baking a butternut squash and a cost effective replacement for canned pumpkin. The best pumpkins for baking are small, pie or sugar pumpkins, which have a sweeter taste than other varieties. 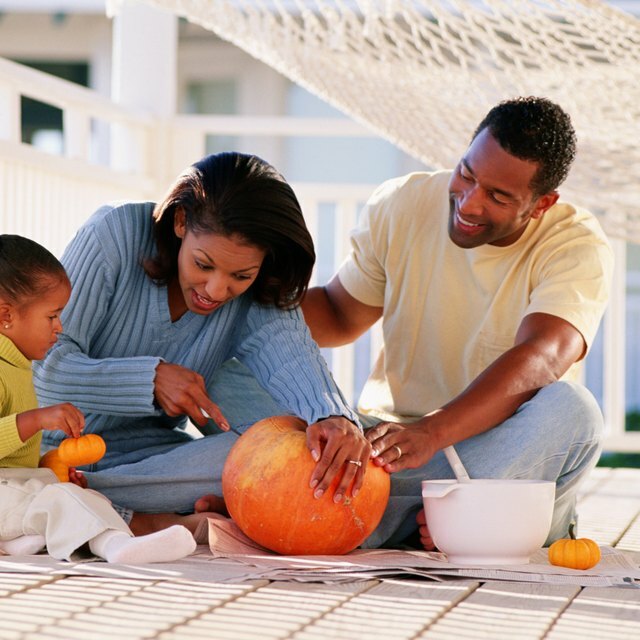 Although pie and sugar pumpkins make a tastier pumpkin dessert or dish, any pumpkin can be used for cooking purposes. Keep in mind that larger pumpkins can be more difficult to cut and somewhat tasteless when baked. Pumpkins can be purchased at your local grocer or pumpkin patch during the autumn months. Wash the outside of the pumpkin with water and remove any dirt or spots with a washcloth. Pull or cut off the stem of the pumpkin and use a large knife to cut the pumpkin in half. Scoop out the pumpkin seeds and any stringy flesh from both halves using a sturdy spoon. Compost or throw out the seeds and stringy flesh, or save the seeds for roasting. Drizzle 1 tbsp. of cooking oil on each of the pumpkin halves. Place the halves flesh side down in a metal or glass baking dish that is at least 2 inches deep. Pour 1 cup of water into the pan. This helps create steam to cook the pumpkin and keeps the pumpkin from burning or sticking to the pan. Place the baking dish in the oven and bake for one hour. Check the pumpkin after one hour and bake for another 30 minutes, if necessary. The flesh should be very tender when poked with a fork. Remove dish from the oven and let stand until cool enough to handle. Scoop the flesh out of the halves using a sturdy spoon and reserve for cooking purposes. Homemade pumpkin puree can be stored in the refrigerator in an airtight container for several days. The puree may also be stored in the freezer for up to three months. Thaw before using.